This principle might work in a perfect world, but the legal environment is far from perfect. A paralegal's real world includes deadlines, chaos, interruptions, emergencies (actual and imagined), last minute projects, trials and, worst of all, other people's disorganization. Piles, often not of our doing, become part of the landscape of your desk. Youstart one project, another is dumped on you, then another, and eventually youe're working in layers. It's amazing that paralegals remain productive at all. If it weren't for our innate abilities to organize and prioritize...as well as juggle...productivity would be nonexistent. 1. Place files in an incline file sorter. Instead of piling files on top of each other so that you can barely tell one from the other, stand them in an incline file sorter on or near your desk. With this simple organizational tool, you'll be able to locate files in a snap. This is particularly helpful for files you'll be working on in the next day or so. 2. Take only what you need to get the job done. Encourage fellow workers (as in the attorney(s) you work with) to give you only as much of the file as is necessary to complete an assignment. For instance, you don't need the client's entire red rope file to schedule three IME's in that Work Comp case. If you have a deposition to summarize, you'll probably only need the transcript. 3. Try to control when you're given work. Receiving work all day long as the spirit moves your boss is inefficient. Instead, try to schedule regular meetings with your boss, such as first thing in the morning and/or immediately after lunch. At those meetings, you should receive work assignments, discuss any assignments you are working on, etc. 4. Create temporary files. If an assignment is accompanied only by a loose letter or document, make a temporary file for it. Use a Sharpie to write enough information on the label or on the front so that the item can be easily identified and won't be lost in the next wave of files that appear on your desk. Put this temporary file in the incline file sorter until you're ready to work on it. 5. Become an instant decision maker. When an assignment, a document or a file comes into your office, decide immediately how to deal with it. Never place it in the 'put it here for now' pile. That pile will just continue to grow. If whatever you've been given to do won't take long, take care of it right then and there. You've already been interrupted so you might as well complete the task before you go back to your work. If you don't need to do it immediately, put it away, or place it in the incline file sorter. Do you have a stack of professional journals, magazines and newspapers on your desk that you intend to read 'some day'? Unfortunately, the stack keeps growing and 'some day' never comes. Again, review those materials as soon as they come into your office. If there's an article you want to keep, tear it out and file it. If there's nothing of interest, throw the material away or recycle it. Remember that most of this information is available on the Internet should you need it so there's probably no need to keep articles. 6. Prioritize throughout the day. As work comes in, make a decision about when you will act on it. Don't just put it in a pile to think about later. If you allow the chaos to accumulate, it will quickly overwhelm you. The disorder may stop you from getting your work done because it's such a mess you don't know where to start. The perfectionist in you will just give up. 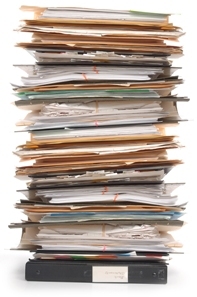 It's easier to make a phone call or check your email than to figure what's in that swelling stack of papers and files. 7. Ask for clear deadlines. Your work will probably fall into one of three categories: do it right now, do it in the next few days and do it sometime in the future. Do it right now. Close up what you are working on, place the material in the incline file sorter, and begin the new work. This interruption is not the most efficient but it's the way the real world operates. Do it in the next few days. Note the deadline in your planner or on your calendar and place the file in the incline file sorter. Do it sometime in the future. If something isn't due for a couple of weeks, you're probably safe to put it away in the file drawer. However, be sure to make a note on your calendar when the work has to be done and when you should begin working on it. 8. Never trust your memory! Take copious notes when someone gives you an assignment but do not use sticky notes! Sticky notes just multiply and either get lost or you become so accustomed to them that you don't even see them. Instead, use a shorthand notebook for your notes. Begin a fresh page every day, placing the date at the top. On the left side of the line, write the name of the client, client number, or whatever information you need to identify the work you'll be doing. On the right side of the page, make your notes. Again, be sure to ask for clear deadlines. If you do receive an assignment with a deadline of two or more weeks away, you'll probably want to put the file away so that it's not taking up space on your desk for days on end. Be sure to enter a reminder on your calendar for the date you need to begin working on the project. Never put a file out of sight in a drawer without a reminder to yourself to do that work. The adage 'out of sight, out of mind' applies when you're very busy. 9. Get those files back to their 'owners'! As soon as you finish a project, move those files off your desk. Don't let them languish there for one minute more than you need them. If they can be closed, all the better. 10. Establish routines. The importance of establishing routines for beginning and ending your work day can't be overstated. At the beginning of your day, review your list of work to do, retrieve the file you will work on first and get going. As other files come to you throughout the day, either put them in your file cabinet or in the incline file sorter. Remember that your floor and client chair do not qualify as file cabinets. At the end of the work day, consider what has to be done during the next one and make a quick list. No. 1 on the list should be the most pressing work, the work with a deadline. Prioritize your work this way. Then close up the work you're doing and either (a) leave the file on your desk or (b) put it in the incline file. You might flag it with a bright sticky note (a sticky note is a good thing when you're using it this way). Your desk will be cleared and you will not be welcomed by chaos and overwhelm when you begin the next day. Your challenge: Consider the 10 tips above and decide which you can incorporate into your daily routine. While you may never quite accomplish having only one thing on your desk at a time, you can minimize the chaos, disorder and confusion by taking even one or two of these steps. Whatever you choose to do, you're bound to improve your workspace and increase your productivity.